Stunning skinny (2.5cm width) version of our phenomenally popular Hermoso belt in pink and navy. Gift boxed. 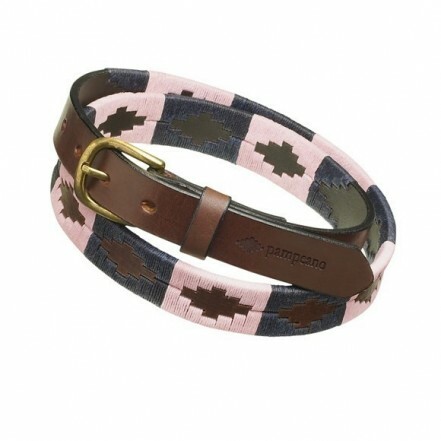 The beautiful thing about pampeano polo belts is that they have been designed to grace the waists of everyone. Not just those charging down the polo pitch and those strutting along side but also those waists that have never attended polo before and can just appreciate a stunning Argentinian leather belt. This particular polo belt, the Hermoso skinny, displays the beautiful pink and navy thread in the striking diamond design. This skinny belt can go with a myriad of ensembles, jeans, a maxi dress or skirt and in particular works well with jodhpurs and polo whites. The feel of the Argentinian leather on all our belts is one of luxury. It softens and warms with age and each pampeano belt becomes a staple piece in your wardrobe alongside a crisp white shirt and a well-fitting pair of jeans. Each pampeano polo belt is completed with a nickel free buckle with an antique gold finish and our pampeano logo embossed onto the end of the leather which will be threaded through the buckle and shown at the front of the belt, alongside the iconic pampa stitching. Dressing for the polo is best to start feet up high heels are not recommended, but wedges and flats work perfectly (especially for divot stomping) and also weather conditions play a big part in your attire. Boots may be required in winter, and a short floaty dress might turn into a nightmare on even the slightest of windy days. Keeping all these in mind there is almost no outfit to which you couldn&apos;t add a pampeano polo belt, as a final touch.